Which New Luxury Sedan Should I Buy? If luxury and high-tech features are must-haves for your next new car in Arlington, look no further than the brand-new TLX. 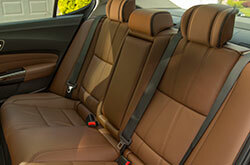 For the current model year, the five-passenger sedan has received refreshed styling for a more refined look. Highlights include a new genuine mesh grille and revamped rear end for V6 models. A sedan that is sure to spark conversation, 2018 Acura TLX reviews can't stop raving about this elegant and well-equipped luxury car. 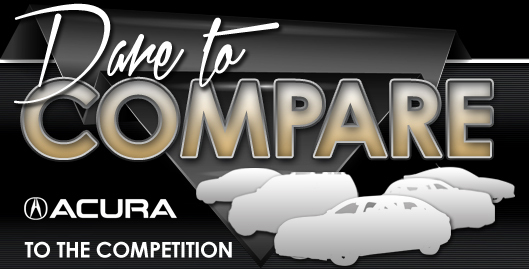 Keep reading to see if the car is right for you. The sedan is offered in three grades: base, Technology and Advance. It comes with plenty of standard features to appreciate, including simulated leather upholstery, dual-zone automatic climate control, driver memory settings and ambient interior lighting. Outside, you'll find 17-inch alloy wheels, a sunroof that is perfect for star gazing, LED headlights/taillights and heated side mirrors. Entertainment-wise, the 2018 Acura TLX in Arlington gets Bluetooth, a USB port, two display screens, satellite radio and a seven-speaker sound system. Even more creature comforts can be had on the Technology and Advance grades, as noted by 2018 Acura TLX reviews. They include navigation, plush leather upholstery, a 10-speaker sound system and new 19-inch wheels for models equipped with the V6. 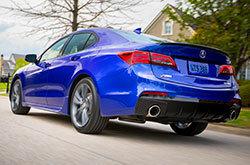 The TLX is powered by a standard 2.4-liter four-cylinder that's good for 206 horsepower and 182 pound-feet of torque. It is paired to a smooth eight-speed automatic that transfers power to the vehicle's front wheels. There's also a more powerful 3.5-liter V6 that can produce 290 horsepower and 267 pound-feet of torque. All-wheel drive can be had on all V6 models only. Every 2018 Acura TLX in Arlington is packed with a wide range of outstanding safety systems that are designed to keep you safe on our busy freeways. Standards include various driver assist features, such as lane keep assist, forward collision warning, adaptive cruise control, automated emergency braking and lane departure warning. In addition, you'll also find that the sedan is fitted with an army of high-quality airbags, antilock brakes and a rearview camera, which makes backing up and parking a breeze. To test drive this luxury vehicle, call or visit our Acura Dealership in Arlington today!